Abigail Anderson launched THE VAULT in February 2011 with an article she wrote that was published by The Blood-Horse’s Steve Haskin on Hangin’ With Haskin. Since then, articles on topics ranging from Secretariat’s greatest son, Istabraq, to the exploits of a hard-working horse from the 1940’s named Molasses Bill, to the power of mitochondrial DNA on the progeny of Rachel Alexandra, Zenyatta and Rags To Riches, to visits with the lovely Black Caviar, aka Nelly, have been published. THE VAULT now boasts a readership of over 70,000 worldwide. Most recently, an article entitled “Frankel: It Takes a Team To Raise A Champion” was selected as Best of the Blogs on the Paulick Report. I fell in love with horses as a little girl and this love was nurtured initially by books supplied by my parents, grandparents and the librarian at our local Pointe Claire library. Author-illustrator C. W. Anderson and Walter Farley’s Black Stallion series, as well as his book about Man O’ War were particular favourites. In the 1950’s, television abounded with animal shows and “Fury,” the coal-black mustang who loved and protected his boy, Joey, stole my heart. Hours were spent with friends “playing Fury”….. or Roy Rogers (I was always Trigger). Northern Dancer. “And to think…he’s only just a pony,” my grandfather said of Canada’s first Canadian-owned and bred horse to win the Kentucky Derby. We keep our own life stories coherent by carrying our past forward in time, a little like the way elephants carry the bones of their ancestors with them when they move to a new place. I’m no different. It was important for me to keep the flame of horses, and thoroughbreds in particular, burning bright within. Part of keeping the faith has been extensive research into thoroughbred bloodlines, the British descendants of the Northern Dancer and the history of thoroughbred racing worldwide. In particular, I search out the stories of the so-called “little people” — the Will Harbuts, Eddie Sweats and, more recently, the Dee Deacons who are pivotal to the lives of the thoroughbreds they care for. The role of genetics in improving the breed is a more recent preoccupation, one that allows me to pursue my interest in a growing body of research that looks at the influence of the dam in shaping a thoroughbreds stamina and speed potential. 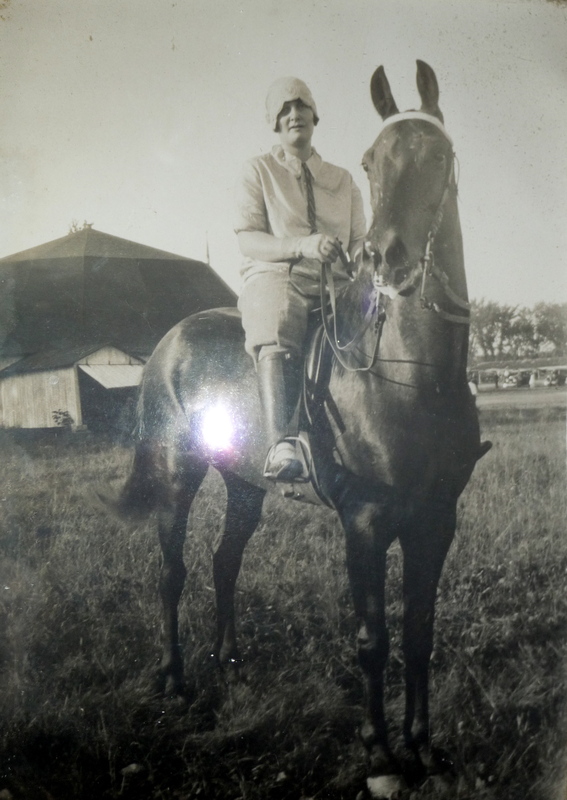 My grandfather’s champion standardbred mare, shown here with Hilda Anderson (no relation) who rode her at country fairs. Circa 1925. The written word and the visual image have long-occupied centre stage in my life. It’s one of those examples of synchronicity that these seemingly unrelated areas have found their expression in THE VAULT. Many of the photographs that appear on these pages come from my own extensive collection. And the narratives told on THE VAULT are often inspired by these same photographs. Molasses Bill and his owner, pictured here in 1946. After I purchased this beautiful photo, I had to know, “Who was Molasses Bill?” So it was that the photo led to an article published in December 2011, here on THE VAULT. At a time when horse racing is struggling to keep its footing in a quickening world, it is timely to promote its exciting — and often dramatic — history. We can protect the things we love when we celebrate their magic and mystery, as well as their contributions to the world of today. The sport of horse racing offers a veritable cornucopia of riches in this regard. What, indeed, does a horse race personify if not the triumph of hope and courage over seemingly unbeatable odds? And the bearer of that message, who has come down to us over the last 300 years, is a majestic creature whose slender legs carry a heart that beats a rhythm to the soul and whose broad brow, it is said, houses the spirit of the divine. This is the mission of THE VAULT — to tell the stories of horses great and forgotten, on whose hooves and hearts we gallop into today. Please note that all articles appearing on THE VAULT are protected by copyright. Permission to copy them, in whole or in part, must be obtained in writing from the author, Abigail Anderson. Thanks so much, Missy Linda. I’m so glad that you’re in my life!!!!! What a wonderful resource all your posts are, Abigail. You are truly a treasure and bring all the backstories to the fore and make these horses jump off the pages of history into our hearts. Every story takes me back to when I was a kid and the first time I read Black Beauty or National Velvet. That’s how your stories about each of the horses you write about start out for me. Thanks for bringing these horses to life once again so they can be known and appreciated. I feel a kindred spirit! I rekindled a childhood love for horses and a passion for thoroughbred racing while I was researching my Grandad’s TB, Dr. Joe Irwin, 1922. I didn’t even know he had a TB racehorse and all I had was the horse’s name and a range of approximate birthyears. Grandad traded $5 or $10 dollars and a pocket watch for him around 1936. He was an old “war horse” and was banned as a renegade at the parimutual tracks because he would not start a race facing the right direction. He faced backwords & whirled around! Grandad fixed that & his hurt leg and he became a local fairgrounds champion. His pedigree was incomplete at the Jockey Club, so I began reading about all the old wonderful horses and their projeny and pieced his pedigree together on http://www.pedigreequery.com When I found out his grandsire was Fair Play and his dam side triple inbred to the Domino line I felt like I hit the lottery. He had Domino’s mother twice (Mannie Gray) and his full sister (Mannie Himyar). I immersed myself in pedigree research one whole winter & I developed a serious passion for Thoroughbreds & pedigrees. I watched Secretariat race as a child and I feel just like that kid again! I fell in love with the old great horses first and then Rachel Alexandra & ZENYATTA lit the fire under me for current racing. I am so happy I stumbled on your web site! It is just my cup of tea. Lois: I am very glad to be your cup of tea! And — yes! — we are indeed kindred spirits. I find it so interesting that you rekindled your passion while researching your Grandad’s TB. MY Grandpa owned one of the first standardbred horses in Quebec in the 1930’s. She was a champion roadster, although ridden too and according to my 91 year-old mother, the crowd at horse shows would stand and applaud her for a good 5 minutes when she came into the show ring. Her name was Topsey Nico — a name that is part of my family history. ( Of course, at that time it was NOT politically incorrect to name a black mare “Topsey.” Today, when I mention her on THE VAULT, I don’t use her name because of how it would be viewed today…) Anyway — it was my Grandpa & my Gramma who planted and nurtured the love of horses in me. So you and I also share that connection! Welcome to THE VAULT, Lois. It was great to read your story. Hi Abigail, I only discovered your blog today and have spent the entire afternoon reading these wonderful articles. So no work done! Thank you so much – I will now become a dedicated reader. The work you are doing is so needed. Thank you for what you do. Although I live in the USA I grew up in England and have special memories of steeplechasing in the 60’s and 70’s. .
Abigail: Allez France was a special favorite of mine. I look forward to the article. As for steeplechasing heroes – there are so many. The mighty Arkle of course ( I saw every one of his races on TV.) I even played truant from school to see one of his Cheltenham Gold Cup wins. Then there was his great rival Mill House as well as his own stablemate Flyingbolt. Then there were some lesser lights who I had a special affection for – Stalbridge Colonist, Rondetto, What A Myth, Dunkirk, Freddie, Harry Black. More recently Red Rum, Desert Orchid, Kauto Star, Denman and a quirky old hunter-chaser called Killeshin. All heroes to me. I loved your article on Istrabaq a great favorite of mine. His owner, JP McManus, retires his horses to a farm in Ireland where they enjoy a wonderful, pampered retirement. He is a true credit to the racing game. Abigail: Stalbridge Colonist was a lovely little grey who once defeated the mighty Arkle – although he was carrying a lot less weight. I would love to find a photograph of him. After Arkle he was probably my favorite steeplechaser of that period. Rondetto ran very credibly in a couple of Grand Nationals finishing 3rd on one occasson – on another he fell when in the lead and looking all over the winner. Freddie twice finished 2nd in the Grand National in 1965 & 1966. What A Myth won a Cheltenham Gold Cup and passed away not too long ago at the ripe old age of 32. Flyingbolt was a stablemate of Arkle’s. He won the 2 mile Champion Chase at Cheltenham among other races. Pat Taafe, who rode both horses, said that he was unable to say which was the better horse. Sadly, Flyingbolt was plagued by injury and they never met on a racecourse. I think that would have been the steeplechase of the century. Rondetto: I have indeed googled Stalbridge Colonist and found a little bit of information. It just drives me around the bend when great horses start to disappear…..but I do promise to persevere! Good to hear from you again! Abigail – Here’s Stalbridge Colonist winning the 1966 Hennessy Gold Cup with Arkle second. What a race! I shall check on e-bay for pictures of him and Rondetto. Did you hear that Ginger McCain has passed away? He and Red Rum will be remembered as long as people talk about steeplechasing. William: This is an incredible video! Thanks so much for sending it along to me. I promise that I will write something on this wonderful boy ASAP. I’ve had some tough family issues for the last 3 weeks, the most difficult of which being the illness of my beloved dog, Jericho. I think we’re coming to the end, he & I, and it’s just very hard. I had not heard that Ginger died — I’m woefully behind in my reading too. Yes, he and Red Rum are icons. Another topic that I must pursue!!! Abigail: I am so glad you enjoyed the video. My heart goes out to you and Jericho. Our animals really are our babies aren’t they? I know my two cats are. We are just very privileged to share their lives and love. I am going to be in England visiting my sister for a couple of weeks but when I get back I must research Stalbridge Colonist a little more. I shall be happy to forward anything I find to you for incorporation in any future article. I agree – Rummy and Ginger would be great subjects for an article. Thank you, William. Sad times right now, but I’ll be delighted to hear back from you upon your return. SIgned up today. Thanks for the reminder. Dear Abigail – I was trying to figure out how to “keep in touch” since the diary has been suspended. I hope this is what you meant and where you want us to try to reach you. I found you of course, through our Z’s website. I have friends that reside in Canada – a small town outside of Toronto ( can’t think of it at the moment) and my address book is downstairs and I’m too pooped to trudge down to get it. If this is not the right spot, please let me know. I too, treasure your blog and your wonderful writings and feel like we are friends across the miles. Take care and hope to “talk” soon. Abigail, Can I just say how much I have enjoyed reading your articles. You have the most informative blog on racehorses, past and present that I have found on the net. Apart from the obvious love you have for your topic, I appreciate the trouble you take to answer every one of the comments posted on your articles. “THE VAULT” has a world wide reputation for the quality of the information found here. Just read Bronwen Healy’s blog and she mentions you and “THE VAULT”. Your attention to detail is wonderful and I’m amazed you haven’t been snapped up to write for the NY Times or Bloodhorse. If I had to choose a favourite article it would be your most recent on Ruffian and the beautiful Kari Bussel. Kari had such a way about her. She made people feel special. She had such an effect on so many people, even though she never met them. Bec from Australia (Ruffian Queen of Racing on YouTube) was one of those. A young girl who had a difficult life and Kari took the time to advise and mentor her. I know Becca has been devastated by Kari’s passing as have all her cyber friends. It’s not often you come across a completely selfless soul like Kari. I hope her work on YouTube remains there for future racing fans to find and admire. I have so much admiration for her daughter Ashton who finished Kari’s last work of her beloved Zenyatta. Kari was so proud of her daughter and grandchildren as I’m sure they were of her. It’s not easy to remember Kari. Every time I do the tears come. I know she will never be forgotten though. Again, thank you Abigail and God bless you. I dont know where to get a hold of you, so I am hoping this does the trick. I am so glad you are contacting her. If anyone can do this justice, you can. Another part of history, that you are so adamate about perserving. This is why no one better to do this…..that, and the intimacy you bring to the horse/person relationship. Thanks so much, and hope this will be fun for you. I have been so busy lately I have only been able to check in a few times recently. Loved the article on Nijinsky (I still blame Lester for the Arc defeat) and really enjoyed the Kentucky Derby info. Hopefully I shall be able to read more regularly over the summer. Thank you, thank you! Looking forward to many hours of pleasant distraction. I wanted to know if i can use the image on epona. Aissat: Go ahead and use it. I found it on a Google Search but there was no info. about copyright. So I guess that I should add: use at your own risk! Hi, I was hoping maybe I could speak with you about a couple of original b/w photos I have of Man ‘O War with his groom, Will Harbut and also the statue unveiling in 1948. If at all possible, could you maybe email me at jabeaujo2@windstream.net?? Lisa: I will most definitely contact you, either today (July 13) or tomorrow from my personal email! Thanks for your patience. Lingfield: I appreciate your interest & support hugely. But I am a “girl” not a “guy.” BLUSH. Fantastic blog Abigail! …found you through a link on Blood Horse. I just visited Saratoga this month and was blown away by the history. You can smell it in the air. The museum and docents are first rate. I could spend 2 weeks in the Hall of Fame reading all the plaques. Yes I have a favorite horse….Whirlaway. A true patriot as he raced many times for the war effort. In those days he ran races between his Triple Crown championship races. Let me know how I can contribute to this great blog. All the best. Abigail thanks for your reply. Might I suggest a book for our readers. It is “This Was Racing” by Joe Palmer former turf writer for the now defunct NY Tribune. Published in 1953 just after his too early death. A gifted writer with much humor and varied tales of the track and it’s many characters. I think it may be out of print but obtainable at Amazon,etc.Highly recommended! I love your site, thank you for doing what the “sports media” should do, but fail miserably. I was glad to see there are now two bios available on Sham, the star-crossed colt who ran second to Secretariat in the Kentucky Derby and the Preakness. I have read reviews, however, indicating that neither is very well written, too bad. Any information on my first TB love would be welcomed. in relation coolmore, sadlers wells did beat seattle song in the irish champion stakes but you mix up his details with seattle dancer who is still the most expensive yearling ever bought at public auction in 1985. he was by Nijinsky out of my charmer and thus seattle slew’s half brother as well as being a three parts brother to Lomond. Hi! I am desperately seeking a photograph of Air Lift, son of Bold Venture, full brother of Assault. Can you please email me? Thanks! I did manage to find a copy of the results of that race though: http://www.sportsjournalists.com/forum/index.php?topic=96978.0 Hope some of this helps! What a great blog–I enjoyed the piece on Imp so much, especially getting to hear the song. And now I am wondering about another horse–Exterminator. I see some great images of him on your site–I love the one of him eating the birthday cake–and am wondering if you have others. I particularly am looking for any image of him with Henry McDaniel. . .thanks so much. Thank you so much! I am actually glad to hear you say that the images are rare, since I have not seen all that many. I do think that might actually be Kilmer in the first, in the straw hat. Are these the two from your collection? on December 28, 2013 at 3:50 pm | Reply Somebody in England! Added this site to my favourites. The NH racing of England and Ireland is beyond compare. If you ever get chance take a month in Ireland in the fall to visit Killarney, Thurles, Kilbeggan etc. Abigail, I looked for an email address for you but can’t find one so I’m posting here instead. I featured one of your blog posts on my list of 10 favorite horse racing blogs/articles here: http://deafequinefanatic.blogspot.com/2014/01/a-collection-of-favorite-horse-racing.html Give me a follow on Twitter @AmandaBry91 if you wish. Keep up the great work–your blog is a favorite of mine! I found this blog today and will be back frequently until I’ve read it all! No need to apologize: real life takes precedence. I am sorry to hear of your loss. There is a book that has just been published, “The Kentucky Derby, Preakness, and Belmont Stakes” by Richard Sowers. It is a comprehensive history of the Triple Crown races, and I am enjoying it. You might want to check it out! Hello, I’m wondering if I can use the image of Epona for the cover of a book? In your article “RACHEL, RAGS AND ZENYATTA: THE POWER OF X, Part II”, you focus on 4 of Secretariat’s daughters specifically but you do not mention why. Secretariat had 10s of daughters and I was wondering what is special about these 4. I checked their pedigrees but found nothing special on them. Is there something different in those daughters that the rest doesn’t have in their X chromosome? I do not know if it’s the right place to ask but I’m really curious about it. Thanks for your time. It is a pretty good book, as far as information goes, but it doesn’t have the “heart” that Laura Hillenbrand’s “Seabiscuit” has. Harness racing needs pages like this . I came across the Vault after researching War Admiral. I recently bought out the estate of an older woman, and came across a small box with a racing shoe wrapped in tissue paper with “War Admirals” written on it several times. Could it have any worth, and how would I go about trying to get provenance? Thanks in advance. We recently started going through some of our estate items we have had for many years. We found three wooden plaques; two that have pictures of “Molasses Bill” in the winner’s circle on April 28, 1946, and May 3, 1946 at Pimilco Racetrack in Baltimore MD. The third plaque shows “Mend” at Havre De Grace MD Racetrack on May 24, 1946. Each wooden laminated plaque measures 11 1/4 by 13 1/2 inches. Two pictures are on each plaque; the Winner’s Circle at the top and the winning photo at the finish line. We believe the common thread between these plaques is the horse’s owner “A. H Ruhl’s” and/or the trainer “D.P. Veneziano”? Perhaps you can confirm this information? These plaques were made at Dura-Seal Laminating Company in Baltimore Md. All three plaques show an A. H Ruhl’s – I’m guessing the owner? All the plaques show 2nd and 3rd place winners and the Trainer as; “D. P. Veneziano”. In addition, both “Molasses Bill” plaque shows “J. Covalli – Up” – I’m guessing this is the Jockey? The “Mend” Plaque shows “N Combest – Up” as the Jockey? We are looking for a value on these plaques as we would like to auction or sell these plaques to raise funds for the “Horsemen Helping Horses” non-profit organization. Triple H rescues horses from auctions and rehabilitates them, and sells them to new owners in order to raise additional funds to purchase more horses and save them from slaughter. We are looking forward to your response. Pictures can be supplied if requested. 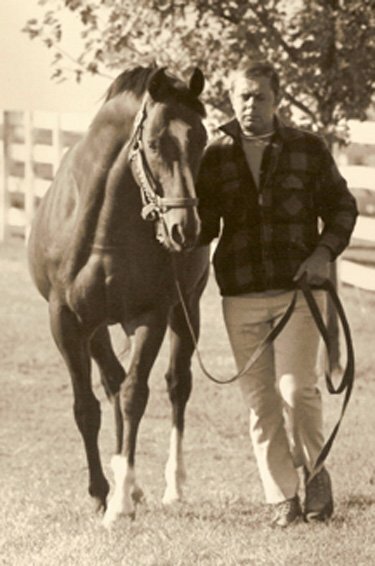 Hopefully, you are able to assist me with some information on the great thoroughbred racehorse, War Admiral. I work in racing administration in New Zealand but I am putting together a fundraising project for Riding For the Disabled. The concept is simply a pack of playing cards that contains a brief history and selected racing career statistics on the 14 famous racehorses from each of the following four regions; Europe, Australasia, The Americas and the Rest of the World. It has been a lot of fun to work on this project, as I am sure you can imagine, and equally pleasing to know proceeds from sales are going to such a good cause. We have decided to include the War Admiral in our select group of horses from The Americas horses, which will surprise no-one, however, one of the statistics we want to include is “winning streak” or “wins in sequence”. 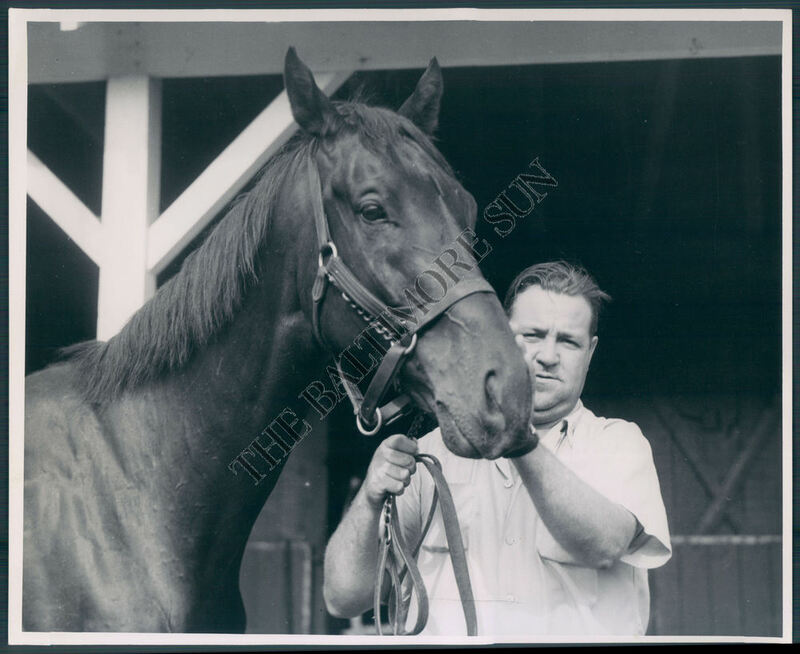 So far we have not been able to find a complete race record for War Admiral on-line, thus enabling us to complete our information. I am writing to you therefore in the hope you will be able to help by either providing us with his race record or the simply, provide us the answer to how many races he managed to win in succession! Hopefully this is not asking to much! Abigail, I’m working as script consultant with the production team of a documentary film on Triple Crown winning jockeys. Your Vault post on Smokey Saunders paints an interesting picture. The trial may explain why he was never inducted into the Hall of Fame at Saratoga? Our film will focus mainly on the (now 4!) jockeys still living. But we will talk about all the others briefly. Did you run across information on where in the Pacific that Saunders served in the Army during WW2? Hi Abigail – Wonderful articles! I have a photograph of Battleship, the same photo you showed in your article. It is signed by Bruce Hobbs and Reg Hobbs. Do you know if this has any value? Hello Abigail, only ‘discovered’ your website today, and although only read two articles so far, i am surely going to keep on reading, there are a lot of great names that instantly brings a smile to my face, because of the fine memories i have of those racing greats. Via Liveauctioneers.com i was brought here, november the 18th an auctionhouse is selling a very fine statue of Kincsem, and because of that beautiful piece of art i wanted to know more about this stunning mare, and more i got, from you! Keep up the good work, greetings from Holland…..
At the top of your page, I noticed the name C. H. Everitt, Owner, under the words Beulah Park. Was C. H. Everitt the owner of the racehorse Miss Vault? I am curious because I am an Everitt by birth, and both my father and I were ‘horse crazy.’ Dad was even a bronco buster in east Texas in the late 1930s. Any information you can give me would be most appreciated. Abigail, urgent notice: FREE HORSES!!!! 52 thoroughbred horses need homes. Will go to Sugarcreek this Sat. for slaughter. Gentleman died and his son wants nothing to do with them. Most broodmares are broke and some are in foal weanling, yearlings, 2 yrs. and 3 yrs. old most are gelded. FREE and papered. Friend of the deceased is trying to find homes. 440-463-4288 Barnesville, OH. I would hate to see all these house put down. PLEASE someone help they are FREE and papered!!!!!!!! Fuzzipariah: so sorry I got here too late to publicize this! We’ve had power failures here for several days and this computer was shut down to save it from short circuiting. What news on these 52? I apologize, because I found out later that this was an old rescue request. It’s one of those that keeps circulating around the web. I should have checked before posting, but my first thought was to get out the word before the horses were lost. How would you find out if your horse has it without them being dead? James: Has what? Sorry, but I don’t understand your question. Just checked my PayPAl. Sent $166 USD a Crystal Davis on Sept 5,2015 towards her rescue. Please tell me that she is part of St. Francis Farm! Otherwise, I lost over $200 CAD. Kylie Pluck Irwin She has a home with Crystal McMillen Davis. Just need help with bail. If I could do it I would. Donna Marie Falquero Where is the fund raising link for this one? Thank you so much dear Fuzzi! I visited Old Friends today, and have pictures, how can I share them? I’d be honored to add a little something to your site. on August 12, 2016 at 6:24 pm | Reply Sue S.
Love this site. Wonderfull to know there are so many caring people out there . I used to own and breed Arabians for almost twenty years, and also opened up my farm to thoroughbreds to slow for the track or had a slight injury, I had one whose sire was third in the queens plate the year Iszvestia won also became horse of the year. Anyway I have a signed numbered limited edition print framed be Janice Tanton 39/390 . If anyone wished to purchase it or we could do an auction on it all shipping due by whoever gets the print and I would be more than happy to donate all monies to securing freedom and safety of any slaughter bound horses. Hi, Abigail, I’ve been working on this story for 3 years … looking to find a photograph of Air Lift, which was the son of Bold Venture, full brother of Assault. I’ve put a lot of time and energy into this, including talking to Helen Groves. I just stumbled upon you. Can you help me find a photograph of Air LIft. I know one exists. Thank you, Joey. Abigail, unfortunately, my entire series (click on the link) is predicated on that article. I want to find an actual photo of Air Lift. Hi Abigail! I have been wanting to email you for awhile now, ever since you corresponded with my second cousin Kevin. His dad forwarded the copies of photos you emailed Kevin taken by my grandfather, W J Gray (Billy). I’ve been searching for his photos ever since I discovered a photo he took on the all of the Reagan Library! No one in the family knew that photo of Woodrow Wilson was there until I came across it May 2014! I’ve since found many vintage movie stars and war planes but was having a difficult time finding the horse racing photos (that I didn’t know about until I read your correspondence). Well, one night as I was watching Sea Biscuit (and crying 🙂 ) I searched for WJ Gray Seabiscuit and found some of his originals for sale by a guy in PA. That man’s father bought them 40 prior when a local bar was closing and they were selling the photos off the wall! I ended up with 6 really cool originals and would love to send you copies via email, if you’d like to see them. Thank you for opening up my world to my grandfather’s hobby turned business! Hi Abigail,l read your piece on Giants causeway found it really interesting. I have the son of giants causeway out of better than honour,,l have breed some great looking young stock.they have got the stamp of their grandfather.thanks for a really well written article. Caught it! Thank you for the heads up, Fuzzi. I’m curious if you have heard of the horse Orient express? My grandfather was a jockey in the late 30s ,early 40s and rode at Saratoga and Hialeah. I have a picture of him on Orient express with the caption “grandson of Man o War. Thank you so much for the information on Orient express, my family had been wondering about the horse for years. We don’t know too much about my grandfather when he raced so this information is great. You have a photo on here of Frankel going down to the start of the 2000 Guineas at Newmarket. Do you know who owns the copyright of this? I wish to produce an oil painting of it for a friend’s 50th birthday (we were there!). I guess as a private work not for reproduction copyright will not be an issue, but I will probably wish to put it onto my Instagram account (adriancope.art) as well, and wonder if that could be an issue. Thank you. Hi Adrian: I think the photographer might be Toby Connors, who you can contact on Facebook. If it wasn’t Toby, I’ve forgotten who it may have been. Hi Abigail, love this wonderful site! Could you please write a story about Winx (Street Cry x Vegas Showgirl), wowing Australian racing fans again this weekend with her 19th straight win? Thank you so much Abigail – I hope you’re feeling much better very soon – bursitis is so debilitating and painful. Love your site! I have a couple questions— I’m looking for an old documentary – with ronnie franklin and Bud Delp- it was from the late 70s or possibly early 80s- I had it on vhs as a kid and watched it allll of the time… I’d love to see it again and all my searches have turned up empty…. Over the years second question- I grew up around racing- dad n brother were jockeys etc – I’ve been gathering racing info that I want to eventually compile into a book (only for myself- not for retail)- just as a personal fave tilype of coffee table book and I was wondering the usage rights to the photos on your site?!?! Can I use the photos for my book? if so, must I make notations- or can I not use them at all?!?! By pure chance, I came across Dark Mirage today, and an attempt to research her further brought me to your wonderful blog. Do you have any resources you can share about that horse? I would love to know more about her and Tuesdee Testa, who I’m also struggling to find information about. It’s beyond me why there isn’t more about them online… Thank you for the wonderful article you wrote, though!! Hello I recently unearthed an old horse racing photo dated June 6 1936. I was wondering if you could provide me with any information because most of the other sources I have tried have come up empty. Abigail love your site . You have enlightened me with your broad specturm in the world of racing thru Horses, people , art, and literature. Thankyou. Read your story on Enable and noticed in her pic how her face was more like an Arabian. Wondered if that is a factor in her ability to run more successful. I know this is odd topic and observation but it spurned a curosity. Superb horse.